Internship | Help Us Celebrate 15 Years of the IRIS Internship Program at AGU! Help Us Celebrate 15 Years of the IRIS Internship Program at AGU! 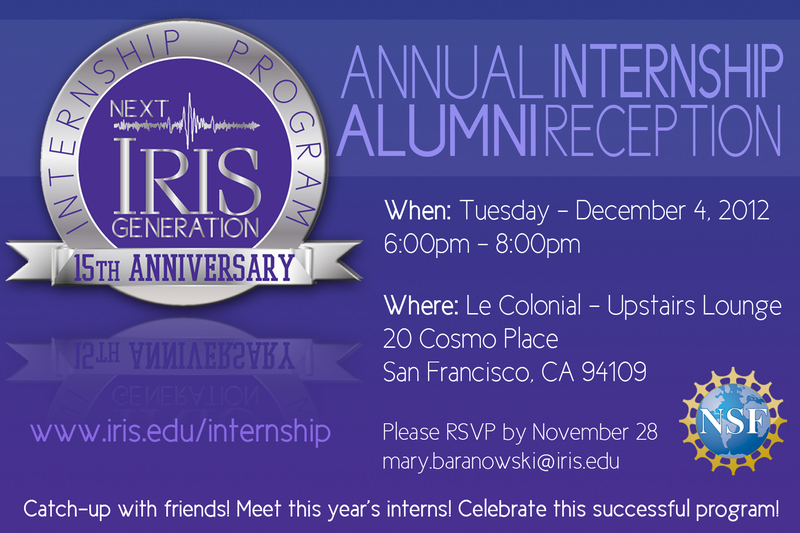 Initiated in 1998, the IRIS Undergraduate Internship Program has placed 129 students at over 50 IRIS institutions. The vast majority of our alumni have gone on to pursue careers in geophysics or other closely related STEM fields. Help us celebrate this highly successful program, catch up with old friends, and make new connections! We are hoping to make this the largest reception we have ever had so please attend and help spread the word! The reception is open to all program alumni and community members who have hosted interns through the program in the past.